•Road clearance to the bottom of the stripper pan is: 40mm for 11Km/hr. maximum speed, 75mm for 8Km/hr. maximum speed. Available width from 1200mm to 2400mm. Width: 300 mm, 450 mm & 600 mm are available. - These push-type sweepers feature 12, 18 and 24 sweeping widths. - Features Long Handle for easy handling. 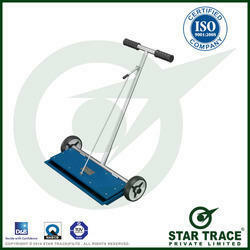 - Wheel mounted for easy movement on rough floor. - Quickly drop collected scrap metal by pulling back on the release handle. - Available in hanging and trolley mounted type models. - Operating height from 75-150 mm. 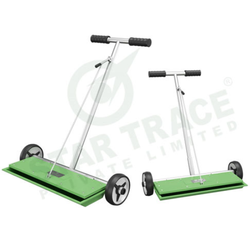 - Sweeps the roads/ shop floor and removes scattered iron particles. Magnetic sweepers are an invaluable piece of equipment when dealing with blast media such as steel shot, steel grit and chilled iron. we are the manufacturer of all type of magnetic sweper . and we use to manufacture magnetic handeler also .